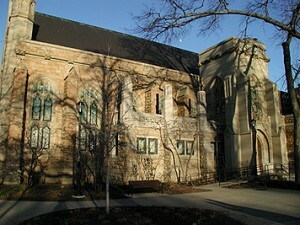 Harkness Chapel, is the setting for concerts presented by the Case Western Reserve University Music Department. 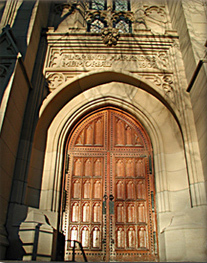 It is one of the loveliest buildings on campus, featuring neo-Gothic architecture, antique oak and Georgia pine woodwork and Tiffany windows. It’s a warm, intimate yet acoustically resonant space that’s ideal for the performance of vocal and instrumental chamber music. The building provides space for music classes, department recitals and concerts. Harkness Chapel was built to honor Florence Harkness Severance, the only daughter of Stephen Harkness and his second wife, Anna M. Richardson Harkness. Harkness made his fortune in whisky and banking, and increased it by joining his friend John D. Rockefeller to form the Standard Oil Company. In 1870, when the company became a corporation, Harkness was the second-largest shareholder. His friend Louis Severance (father by his first marriage to John Long Severance, builder of Cleveland’s Severance Hall) was also an important stockholder. 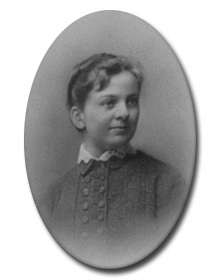 As a girl and young woman of Cleveland’s privileged class, Florence Harkness was brought up in a tradition of charitable work. Her childhood neighbors on Millionaire’s Row included the city’s most prominent philanthropists; her favorite Sunday School teacher was the influential Flora Stone Mather. After a primary education at “Mrs. Day’s School” in Cleveland, she was sent off to boarding school in Farmington, Connecticut, and finishing school in Boston. Upon her father’s death, she came into control of a sizeable trust fund, which she used to support charities in Cleveland and elsewhere.She was active in Cleveland’s Stone Church, in foreign missionary work, and especially in a settlement house for the working poor, the Lend-a-Hand Mission. Quite independent for her time, she lived for a time on her own in New York City, where she continued to work for the welfare of children and the sick. The few letters which survive show her to have possessed a friendly sense of humor, and imply that she was quite content with life as a single woman. Her portrait (which still hangs in the anteroom of Harkness Chapel, just to the left of the fireplace) shows a soft, gracious person with a kind, almost childlike smile. 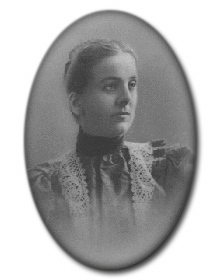 In 1894, just before her thirty-first birthday, Florence became Louis Severance’s second wife. After the September wedding, the two cruised off on the “Kaiser Wilhelm II” to tour the Mediterranean and Italy, returning to Cleveland in January of 1895. That spring they settled at the Harkness estate in Willoughby. Florence took ill early in June, and died July 29, after only ten months of marriage. Following 19th-century tradition, the funeral was held at the family home, 1341 Euclid Avenue, which was bedecked with roses-Florence’s favorite flower. The cause of death was unmentioned in her obituary and in the eulogy at the funeral, but her death certificate lists it as septicemia. Did it start as a cold taken at a late spring picnic, or was it a pregnancy gone awry? Given the healthy-looking woman of the portrait, one can only speculate. She is buried in the Harkness family plot at Lakeview Cemetery. Shortly after her death, her husband and her mother provided funds to erect a building in her memory at Western Reserve College. Severance and his friends Henry R. Hatch and Hiram Haydn formed a planning committee and hired Charles F. Schweinfurth, who had designed many Euclid Avenue mansions, as architect. Ground was broken on June 14, l899. The original purpose of Harkness Chapel was not music but (in the words of Haydn’s dedicatory speech of Easter, l902) “reverent and intelligent study” of the Bible by young women of the College. Said Haydn: “It appeals in its entirety-Chapel and classroom- to the religious nature of the student, and summons her not to neglect the choicest gift of God within her, nor to stifle the cry of the soul for God.” Since l902 the Chapel has been remodeled several times. In l918, Schweinfurth redesigned the transepts; that addition was financed by Anna Harkness. The organ was rebuilt in l922 by the Austin Organ Company. In 1973, Harkness Chapel was declared a Cleveland landmark by then-mayor Ralph Perk, and was re-dedicated by Dean Elizabeth T. Hastings of WRU College for Women as a “haven” for the Music Department. The most recent changes occurred in l990, when the stage was enlarged, the lighting and audio recording equipment modernized, and the building was made handicapped-accessible. The organ had long been unusable, and would have cost hundreds of thousands of dollars to repair, so the console was removed as part of the stage renovation. Funds for the project came from the Leonard and Harvey Krieger President’s Endowment Fund and from the Office of the Dean of the College of Arts & Sciences. The green velvet cushions on the pews were provided by an anonymous donor in 1994. The addition of the Harkness Multimedia Classroom began in December, 1998. Students currently benefit from lessons enhanced by video and computer projection, wireless mobile device presentation via Apple TVs, digital document cameras, high quality audio, and other forms of media. Additional work to Harkness Chapel included refurbishing the stained glass windows, adding fire prevention measures, expanding the stage, installing climate controls, and installing additional stage lighting. Sources for this sketch of Florence Harkness and her Chapel include the archives of Cuyahoga County, Case Western Reserve University, Lakeview Cemetery Association and Miss Porter’s School, and documents in the library of the Western Reserve Historical Society. Photos can be found on the WesternReserve Flickr page. We welcome any additional information that readers may be able to contribute. Please contact the Music Office at music@case.edu.